Tonight on CBS Criminal Minds continues with an all new Wednesday May 4, season 11 finale called “The Storm,” and we have your weekly recap below. On tonight’s episode season 11 ends with Hotch (Thomas Gibson) being apprehended by a SWAT team for suspicion of conspiracy. On the last episode, the BAU entered into a dangerous game of cat-and-mouse with a convicted serial killer after guards at a Virginia prison intercepted a package with evidence relating to the kidnapping of two boys several years ago. Did you watch last week’s episode? If you missed it we have a full and detailed recap right here for you. Criminal Minds Finale Recap: Season 11 Episode 22 “The Storm” Begins HERE! Tonight’s episode of Criminal Minds kicks off with Rossi at home with his girlfriend, and making her breakfast. Joy starts calling both of their phones, but they decide not to tell her that they are seeing each other again – they want to wait until they can tell her in person. Reid arrives at work, Penelope corners him and can’t wait to tell him about her trip to London to see Ashley. Meanwhile, Hotch and JJ are trying to get the kids dressed and out the door. A SWAT team kicks in the front door with guns blazing and they announce that Hotch is under arrest. He tries to show them his FBI badge, but they know who he is – and he is still under arrest. JJ heads to the office, and she brings the kids along with her after that traumatizing experience. Rossi gets a text that Hotch is being held down town. Rossi heads down to the station and tries to tell the police that it is all a big misunderstanding, but they whisk him away in a Department Of Justice SUV. Hotchner is taken to an interrogation room – they play a 911 call that came from Hotch’s cell phone. It’s definitely Hotch’s voice on the other line, he creepily says “Today Will Change Everything.” Hotch swears that he is not that one that made the phone call and he is being set up. Meanwhile, Rossi, JJ, and Garcia try to get to work on the phone call. Thermolene diesel fuel, ball caps, ball bearings, and a white van were all items that were bought by someone with Hotchner’s ID over the course of the last few weeks. It doesn’t look good for him – someone is framing him for a huge bombing. Reid thinks that Antonia is behind this, he points out that she threatened Hotch and told him that “a storm was coming.” JJ pays Antonia a visit at prison to question her. JJ brings up Antonia’s estranged son, she accuses him of framing Hotchner. JJ snarls that her son is on the “shoot first ask questions later” list. Antonia agrees to cooperate, but she wants JJ to promise that her son won’t get hurt. His name is Asher Douglas, he’s in his early 40’s and he lives in Virginia. Back at the FBI office, Antonia tracks Asher’s online purchases and finds proof that he bought the software to manipulate Hotchner’s voice. In the interrogation room, Hotchner is not a happy camper. He demands to know why the FBI and internal affairs has been following him around for weeks. They play a video for him, they got a “tip” from Peter Scratch, and took a closer look at Hotch and realized he was not following protocol and making rash decisions. Reid and the FBI head to Asher Douglas’s address – he’s a little strange, but he definitely doesn’t seem dangerous. Reid is able to talk him down and get handcuffs on him. Reid tells the SWAT team to take it easy on Asher. Afterwards Reid explains to Rossi that they are wasting their time with Asher because he is Autistic. Reid sits down with Asher and he asks him what he knows about bombs, and the supplies that Hotch is being accused of buying. Asher confesses that he met someone in a chat room and told them how to make a bomb and they discussed the feul that was bought in Hotchners name. Garcia traces the chat username and finds that it belongs to an Anarchist named Eric Rawdon that is currently is prison. While they are putting the pieces together about Eric Rawdon, there is a massive prison break at the jail where he is being held. The FBI questions Hotch about Eric Rawdon. He confirms to internal affairs that he put him behind bars – and Rawdon is a fire bug. It’s Rawdon’s life long dream to blow up an entire city, just to enjoy watching it go up in flames. Reid and the rest of the team rush to the prison where the riot was reported. They rush to Rawdon’s cell block and he is done – he and his friends dug out a tunnel. Rossi cuts the prisoners off on the other side of the tunnel. Little do they know, Rawdon isn’t in the tunnel, he stayed in the prison and has put on one of the guards’ uniforms. Meanwhile, Dr. Lewis has problems of her own. While searching the prison, she wound up in the serial killer wing – and they are surrounding her. One of the men she put away recognizes her. Lewis radios for help, the SWAT team comes to her rescue and kills a few of the prisoners in the process. Hotchner convinces Internal Affairs to let him go to the prison and help them catch Rawdon. Hotchner arrives in time to help JJ and Reid take down Rawdon – he confesses that his Anarchist gang is in the process of setting off a bomb to blow up the entire city, Hotch figures out that it is at the Ivory Towers. The FBI rushes to the towers and sure enough the guys that Rawdon was talking to online are in the process of setting off the bomb. They try to make a getaway in a helicopter, but Hotch and his team shoot down the helicopter and take them out. The bombing has been adverted and Hotch’s name is officially cleared. Tonight’s episode of Criminal Minds ends with Hotch and JJ rushing back to the office to get their kids. Jack doesn’t exactly seem thrilled to see his father – and he gives him a cold greeting before he takes him home. Rossi finally gets home and his girlfriend is not thrilled that he was out all night – she cries that everything is still the same and she is going home. Obviously Rossi hasn’t changed. He begs her not to leave, and tells her to meet his team with him – then she will understand. She agrees to stay on one condition, if they call Joy and tell her that they are back together. The next day Rossi has his whole team over for dinner, with their families. 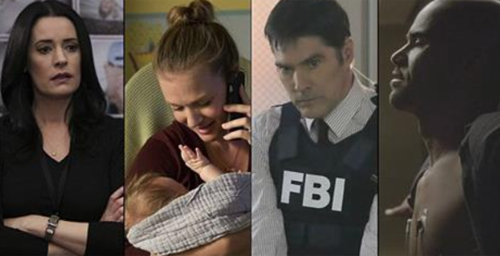 JJ gives Hotchner some parenting advice, she tells him to just “enjoy being Jack’s dad.” Their night gets interrupted – Hotch takes everyone aside and tells them that there have been three more prison breaks in the past 24 hours in three different states, all because of the group Rawdon started online. One of the men that escaped was “Scratch” – and they need to find him ASAP.